Eps 141 - You Kept Everyone Waiting! A Reborn Gohan Returns to Earth!! Eps 142 - Buu is Overwhelmed! Ultimate Gohan's Superpower!! Eps 143 - Buu's Trick - Gotenks is Absorbed?! Eps 144 - The Great Kaioushin’s Bright Idea! Son Goku is Revived!! Eps 145 - One Time Only Miracle… Will the Super Combination With That Guy Come About? Eps 146 - Invincible! Ultimate Warrior Vegito! Eps 147 - The Ace up Buu's Sleeve! The Warriors are Absorbed!! 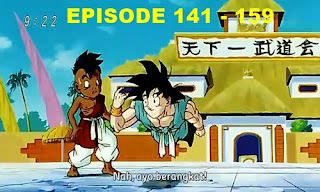 Eps 148 - Rescuing Gohan and Company! Goku and Vegeta's Infiltration Mission! Eps 149 - Emergency Escape from Inside the Body! Buu's Reverse-Transformation is the Worst!! Eps 150 - Earth Disappears!! The Original Buu's Single Cruel Blast!! Eps 151 - Final Decisive Battle! A Conclusion in the Realm of the Kais!! Eps 152 - Do Your Best, Kakarrot! You Are No. 1!! Eps 153 - A One Minute Battle: Vegeta's Life Risking Stall Tactics! Eps 154 - A Secret Plan Comes Together in a Flash. Please Grant These Two Wishes! Eps 155 - Give Me Energy! We'll Make a Huge Spirit Bomb!! Eps 156 - The Savior of the World is You! Everyone's Spirit Bomb is Completed!! Eps 158 - And So, After 10 Years... The First Tenkaichi Budokai in a Long Time! Eps 159 - Even Stronger! Goku's Dream Never Ends! !